Home-made tortilla chips are cheaper and less greasy than the store-bought. You control the salt. You control the fat. You control the horizontal and vertical (sorry ...). They are great with my guacamole recipe from the other day, or even store-bought salsa. Use wheat and/or corn tortillas to make the chips. My favorite flavor depends upon the dip or topping used with them. I like the smaller (around 6 inch) taco-sized tortillas, because the larger (10 inch) burrito-sized ones make chips very large and too fragile. Avocados are 99 cents at the Try 'n Save this week, so it became necessary to purchase a couple. One my favorite things to do with them is to make guacamole. Truthfully, aside from garnishing a salad or soup, guacamole is the ONLY thing I know what to do with an avocado. Luckily, I happen to like the stuff. Restaurants might serve guacamole with sour cream on or in it, but a fully ripened avocado is creamy-ish by itself, making the addition of dairy very unnecessary. I like hot tuna. And other heavy metal bands <rimshot>. Over 20 years ago I clipped a recipe out of Family Circle magazine for a white clam sauce recipe (this particular version is not on its website). For obvious reasons,I had to tweak it a bit to produce the more kosher recipe below. 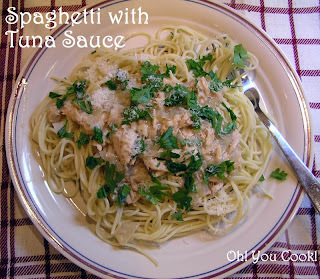 The tuna sauce fixes up quickly while the pasta is cooking. You can make it in the microwave if you prefer, but if you are using wine the sauce has to reduce, so there's no real time savings (Or, as Scotty says, "Captain, you kenna change the laws of physics!"). If you prefer not to use wine, then just omit it and skip the reduction step. But it's really better with wine. If you are worried about feeding the spiked version to your kids, the alcohol burns off in the cooking leaving behind massive flavor, so don't worry about getting arrested. The original of this recipe is mated with the chocolate cupcake recipe in Cook's Illustrated magazine. When I took a look at the ingredients list, my rapier-sharp mind determined that it was virtually identical to the swiss meringue buttercream recipe from the other day. Since I had plenty leftover from frosting the chai latte cupcakes, I simply plopped the remainder into the mixing bowl, then added in half the chocolate called for. The following is the full version. This is the leftover frosting from the other day. If you are starting from the beginning, you will have more. There's more there than you think. It only looks tiny because the bowl is big. I recently discovered Cook's Illustrated. It is a magazine with recipes you could gain weight from just reading them. Some recipes have back stories, explaining in excruciating detail how they were developed. The May issue has what looked like the definitive chocolate cupcake recipe. The back story explains why the consistency of a cupcake has to be different than that of a regular cake. Since a cupcake is eaten out of hand, it cannot be as crumbly as a plated cake eaten daintily with a fork. But a less-crumbly cupcake is therefore less tender. The story goes on and on. You need a paid subscription to access the articleonline, so go to the library and read the magazine instead. This chocolate cupcake recipe, based on the one in the magazine, manages to hold together nicely, yet be tender and thigh-increasingly delicious. This is the frosting I decided to use on the Spiced Chai Latte Cupcakes I made a few days ago. It has a bunch of steps, but they are relatively simple. It calls for granulated sugar, rather than powdered. I have a small problem when using powdered sugar. A cloud of powder rises up and envelopes the kitchen as soon as the mixer turns on, no matter how slowly I nudge it past "stir," covering everything that is not covered. So this recipe makes my short list. But the kicker was how Love & Olive Oil raves about how this recipe was to die for. Well, if you can't trust a perfect stranger's blog, who can you trust? 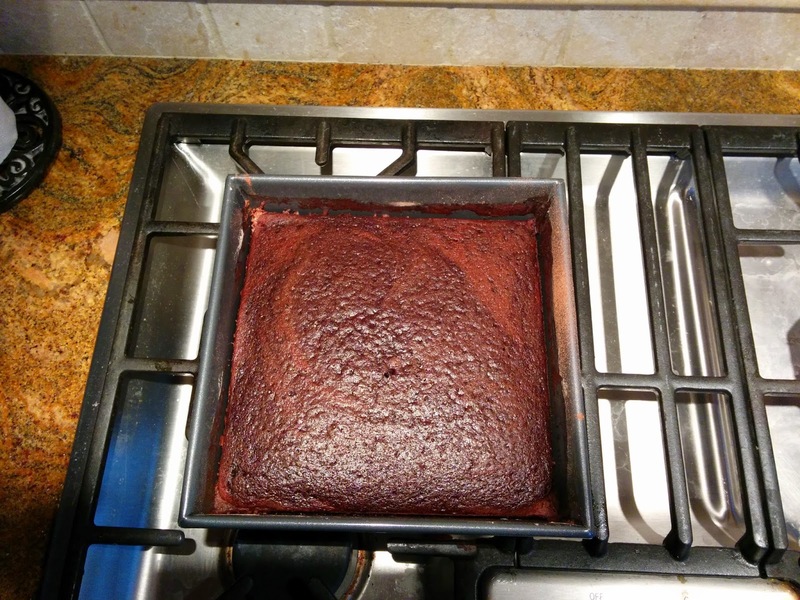 A funny thing happened on the way to making my parve chocolate cake. Let me tell you about it. Up until now, this cake was fool-proof . Mix and bake in the same pan. No mixer needed. I made the cake with a minor variation I had done several times in the past ... I lined the pan with aluminum foil so that I could pop out the cake and travel with it. In this case, it was heading to my mother-in-law for her birthday. Whisk, then pop it into the preheated oven. Simple. Hmmm ... cracked a little, but that's no biggie. Except when I pulled on the foil, the foil ripped and the cake broke into massive chunks. Apparently, when I whisked the batter, I must have cut the foil a bit (and when I say "a bit" I mean "a lot"). Batter oozed under the foil, where it burnt and melded with said foil. Despite soaking the corning dish for several hours, I still had to chisel out the remaining foil shreds.